Since its release, more than 90 mods have already been shared and downloaded using the tool. 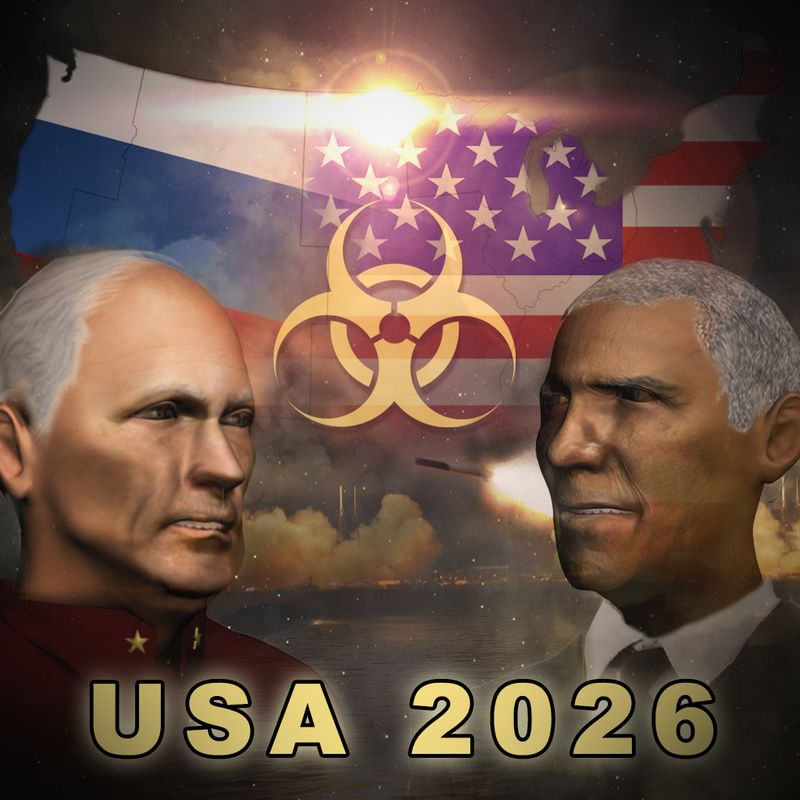 In 2026, after a world war that devastated and contaminated the entire northern hemisphere, the player takes on the role of American president Jack Ohama, whose goal is to lead his country out of chaos and re-annex her lost territories. 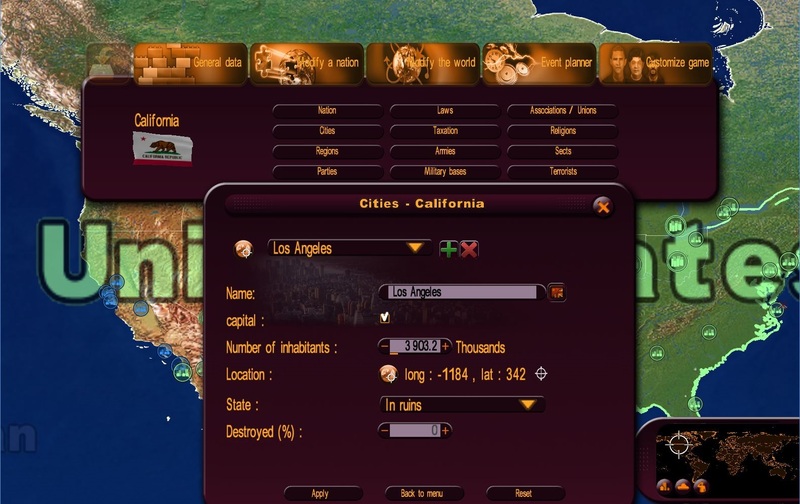 In this scenario, the modder has destroyed cities and railroad networks and created various epidemics in the territories affected by the war. The scenario itself has about 120 events and 50 texts, with numerous scripted twists and turns occurring along the way based on the player’s actions. 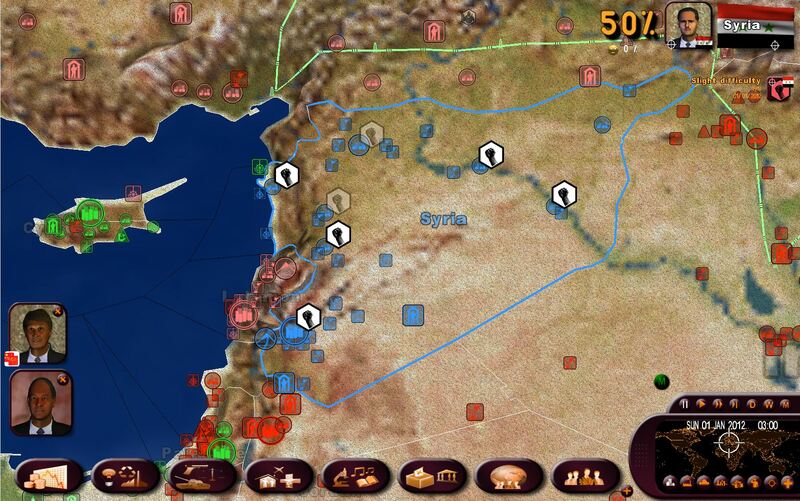 In this scenario, the player plays the head of state of a country affected by the Arab Spring. The objective is to shift to democracy before the people get rid of him. The countries you can play: Syria, Yemen, Bahrain, Iran, Saudi Arabia, Jordan, China, Cuba, North Korea, Oman, Mauritania, Sudan, Kuwait. With the Event Planner in this scenario (see the below screen capture), the modder can create different kinds trouble (demonstrations, riots...). With the Event Planner, you can choose the instigator of, the motive for, the seriousness of, the location of, and the conditions for triggering the event. These conditions can be a function of the specific timing (e.g. on such a date, a demonstration starts), of the value of one or several variables (e.g. : the dictatorship in the country is too strong), or other events that are triggered in the scenario (e.g. : a warning has been sent to the player). Text specific to the scenario, from newspaper articles to character requests, have been written and scripted by the modder. The modder selects the authors. In 2015, Huntington's theory becomes a reality. 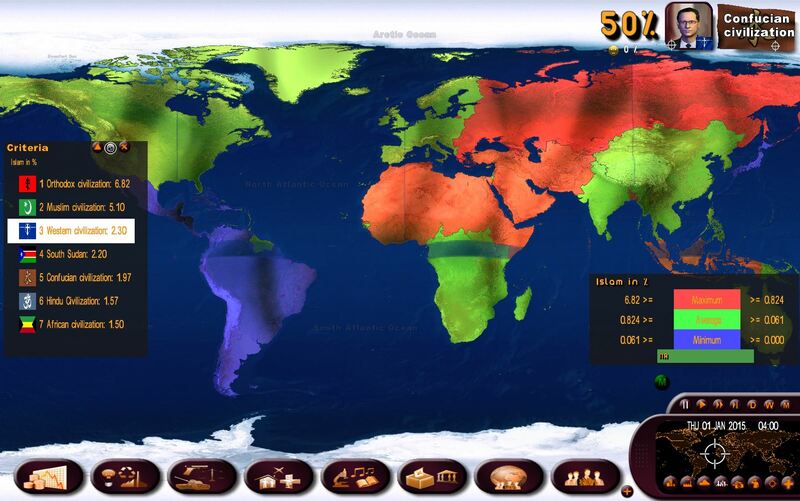 The nations with the same values have been grouped into eight main civilization blocs: Western, Islamic, Confucian, Latin-American, African, Hindu, Slavic Orthodox, and Japanese. 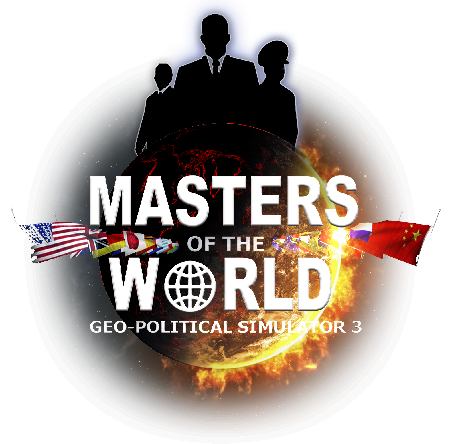 The player must choose sides and face up to this new world order. In this scenario, the modder has grouped several countries together to form one single one. The modder also modified the diplomatic alignments among the 8 countries that have been formed in this way.